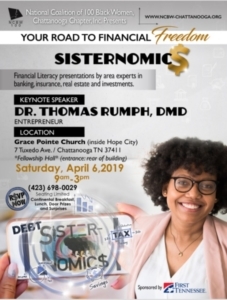 The National Coalition of 100 Black Women, Chattanooga Chapter, Inc. (NCBW) proudly presents A SisterNomic$ financial workshop for women. The event will be held on Saturday, April 6, 2019 from 9AM-3PM at Grace Pointe Church, 7 Tuxedo Avenue, Chattanooga, TN 37411. We strongly encourage the community to come out and hear from area experts as it relates to banking, insurance, as well as real estate and investments. This year’s keynote speaker is Chattanooga businessman, dentist and radio host Dr. Thomas Rumph, DMD. This event is free and open to the public. A continental breakfast and lunch will be served. However, seating is limited. RSVP today through April 1st by calling 423-698-0029. Click the button below to donate to our scholarship program.